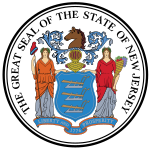 New Jersey /njuːˈdʒɜːrzi/ ( listen) (sometimes referred to as Jersey) is a state in the Mid-Atlantic and Northeastern regions of the United States. It is bordered on the north by New York, on the east by the Atlantic Ocean, on the southwest by Delaware, and on the west by Pennsylvania. Parts of New Jersey lie within the sprawling metropolitan areas of New York and Philadelphia. Inhabited by Native Americans for more than 2,800 years, the first European settlements in the area were established by the Swedes and Dutch in the early 1600s. The English later seized control of the region, naming it the Province of New Jersey, which was granted to Sir George Carteret and John Berkeley, 1st Baron Berkeley of Stratton as a colony. The name was taken from the largest of the English Channel Islands, Jersey. New Jersey was an important site during the American Revolutionary War; several decisive battles were fought there. The winter quarters of the revolutionary army were established twice by George Washington in Morristown, which was called the military capital of the American Revolution. Cities such as Paterson and Trenton later helped drive the Industrial Revolution in the nineteenth century. New Jersey's position at the center of the Northeast megalopolis, between Boston, New York City, Philadelphia, Baltimore and Washington, D.C., fueled its rapid growth through the suburban boom of the 1950s and beyond. Barnegat Lighthouse, colloquially known as "Old Barney", is located in Barnegat Lighthouse State Park on the northern tip of Long Beach Island, in the borough of Barnegat Light. It sits along the Barnegat Inlet. Walter Bruce Willis (born March 19, 1955), better known as Bruce Willis, is an American actor, producer, and musician. His career began in television in the 1980s and has continued both in television and film since, including comedic, dramatic, and action roles. He is well known for the role of John McClane in the Die Hard series, which were mostly critical and uniformly financial successes. He has also appeared in over sixty films, including box office successes like Pulp Fiction, Sin City, 12 Monkeys, The Fifth Element, Armageddon, and The Sixth Sense. Motion pictures featuring Willis have grossed US$2.64 billion to 3.05 billion at North American box offices, making him the ninth highest-grossing actor in a leading role and twelfth highest including supporting roles. He is a two-time Emmy Award-winning, Golden Globe Award-winning and four-time Saturn Award-nominated actor. Willis was married to actress Demi Moore and they had three daughters before their divorce in 2000, following thirteen years of marriage. ... that the original plans for the Laurence Harbor NJ Transit station included a large commercial and residential development? ... that at a fantasy basketball camp, John W. Rogers Jr. defeated Michael Jordan in a game of one-on-one, witnessed by John Thompson, Jr., Mike Krzyzewski and Damon Wayans? ... that Grove Church Cemetery has been called "a cemetery for the living"? For more information on how you can help, see the WikiProject New Jersey.